The final round of the AFL Ontario season played out on Saturday the 8th of September at Humber College South. In a tight end to the season three first division sides, including the Toronto Dingos, went into the final weekend level on points and fighting for two finals positions. The Dingos found themselves kicking off the day’s festivities with the first game of the morning against the High Park Demons. 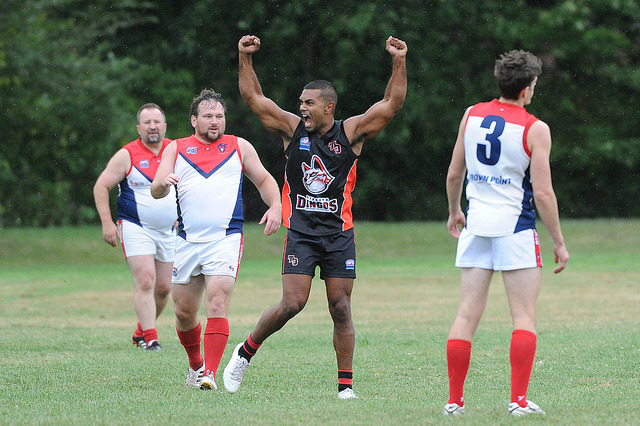 To avoid needing to rely on later results the Dingos knew they needed a win, and a big one. As if the ladder situation wasn’t enough to play for, the Dingos also came into the weekend knowing that full forward Rob McNaughton was leading the league goal kicking race by 3 goals, the outcome of that race also sure to be determined by the day's games. Finishing out a tough year the Demons were only able to muster 13 players on the day, given the do or die circumstances the Dingos came down to 16. In the opening term the Dingos got the scoreboard ticking over quickly, but found themselves trying a bit too hard in some cases and leaving some points on the table. Possibly best exemplified by ruckman Steve "Snip Jr." Gordon faking two handpasses to Rob McNaughton before landing a beautiful kick from right in front - straight through the wrong posts. Great behind. At the end of the first quarter the dingos still found themselves where they wanted to be. Once things settled in the second quarter the scoreboard really got moving. To the Demons credit though despite being outmanned and outgunned they never gave up the endeavor and were eventually rewarded with two goals in response. As expected Rob McNaughton was in the goals and finished with a bag, but he was well assisted by Thomas Santibanez-Espinosa in the forward line as well as Michael Ladd and Justin Powick powering through the middle of the ground. Coming out of the half it seemed like the Dingos were a chance to hit to hit 200 but it ultimately wasn’t to be. When all was said and done the Dingos prevailed 27.17-186 to 2.1-13, with McNaughton good for 9 and Santibanez-Espinosa good for 7 of his own and best on ground. Sean O’Reilly also provided an excellent target all day with his towering torpedos causing all kinds of havoc for the Demons backs. Greg Gilbert and veterans Gary Conlon and Steve Gordon snagged one each for their trouble as well. Word is none of them are going to wash their socks again. In the game immediately following the Grand River Gargoyles were defeated by the Etobicoke Kangaroos,sealing the Dingos finals entry. The Hamilton Wildcats also won their match against the Central Blues, pipping the Dingos for 5th spot by just over 1 point on for and against. The Dingos will now face the Roos in their first round of finals. They’ll need to look to provide four quarters of consistent endeavor, having been neck and neck with the Roos after three in their previous encounter but falling away in the end.